Last week, I took this photo of a family of discoid cockroaches at the Audubon Insectarium in New Orleans. Yesterday, a man in Florida died, apparently after eating too many of them. In response to the disaster, Six Flags Great America is now reviewing their plans to hold a similar event on Friday. The question is, was it the bugs’ fault? We won’t know for certain until the coroner’s results come back in a week or two. In the meantime, here are a few things about discoid cockroaches you may not have known. Despite the creepy name, there is nothing inherently deadly about either Death’s Head or False Death’s Head cockroaches. And in spite of their large wings, they don’t generally fly, so you can release those visions of careening Palmetto bugs that might be flitting through your mind. 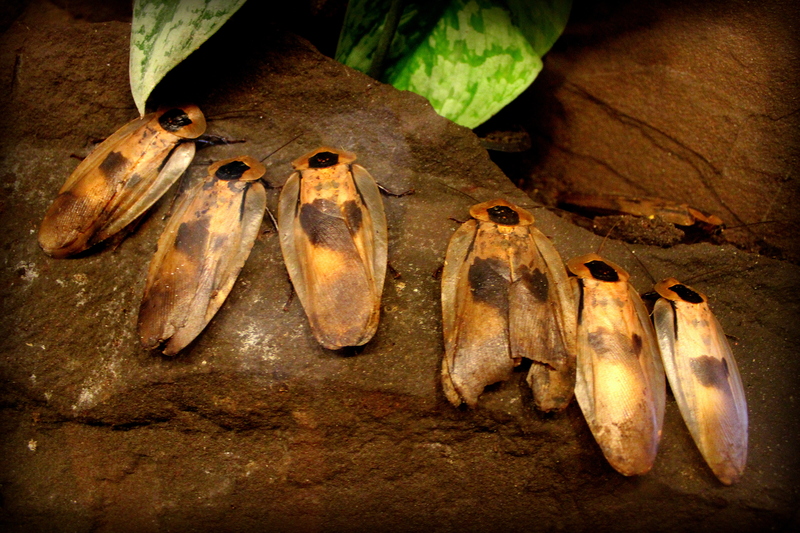 Discoid roaches, unlike true Death’s Heads, are good breeders, and are quite productive in captivity. Think of the difference between big cats and housecats – it’s much easier to coax a litter from the latter. The term “litter” holds true in this case: like mammals, female discoid roaches are viviparous, which means they give birth to live young. Because of their speedy breeding, discoids are a popular feeder insect for reptiles and large arachnids. Their inexpensive availability likely led to their inclusion in the Florida eating contest. They are also relatively easy to keep. They have almost no odor (unless they are really afraid of something) and keep their enclosures tidy, requiring less cleaning than a goldfish tank. They eat a vegetarian diet of mostly raw fruits and vegetables. It’s likely the roaches in the contest had a better overall diet than the eaters themselves – indeed, better than most of the meat we eat. Nevertheless, eating a large quantity of an unknown food is inadvisable, especially if the food is alive and kicking as you do so. Since cockroach and shellfish allergies can apply, it’s better to start with, oh, I don’t know, just one? And for goodness sake, always cook your bugs. It’s safer and they taste better. For more information about the inner lives of roaches, check out David George Gordon‘s The Compleat Cockroach, and for a roach recipe, should you want to try them for yourself, check his Eat-A-Bug Cookbook (soon to be re-released!). Did they ever learn what part of the insect caused his death?